Don’t worry we can fix or upgrade your Macbook or Macbook pro! Mac hardware just like any other computer is prone to fail due to the problems that all computers suffer from. Dust and failing solder points from overheating cause problems like the loss of USB ports, Video, Audio, Track pad and keyboard, not to mention least of all the famous fix in our video of the Black Screen of death. We can fix just about any Mac issue. Stop by for an honest diagnosis and repair quote. Any MacBook or MacBookPro with ATI or Nvidia graphics can be affected by problems with overheating. 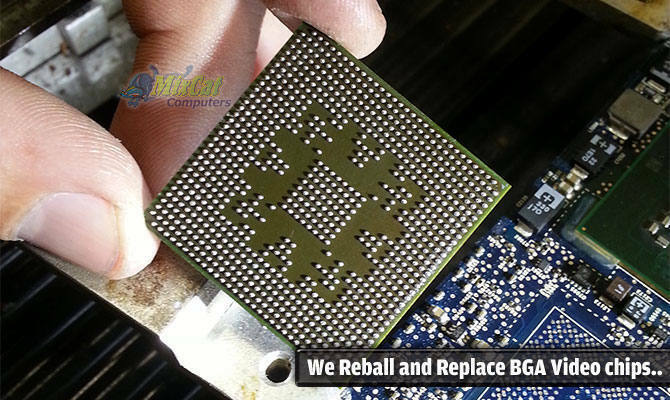 At Mixcat Computers located in Kissimmee Fl we are able to reball, reflow and or completely replace the Nvidia GPU (graphics chip). Did you know most shops just replace the logic board costing well over $600! At Mixcat Computers prices starting under $199 you can save a lot of money on your investment. Contact us for more information today!